This past summer, I had plans to teach Indigo how to sew. She's 9 1/2 and such a capable girl. She loves knitting and felting and working with her hands. She's creative and artistic. Sewing seemed like a natural fit. We had fun picking out fabric together. We printed and tiled the pattern together. I showed her how to lay out a pattern on the fabric in the correct way. Then it was time to sew. She practiced sewing on a printed practice sheet before we began. But after one sheet, her interest waned. 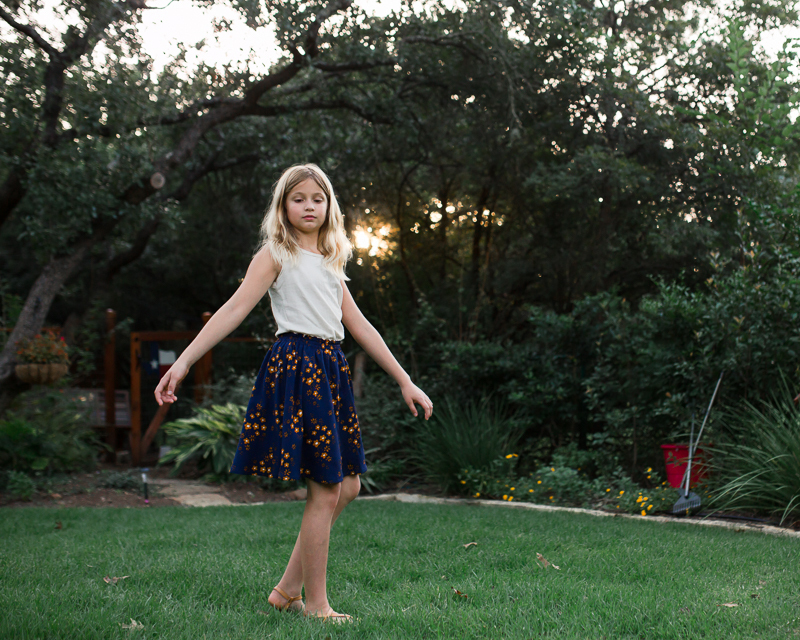 The skirt laid (cut out) on my sewing table all summer long. I would ask her if she was ready to sew it together. She would suggest we do it another day. I didn't want to push it. I'd ask again a week or two later. Not today, she'd tell me. Then, our summer was over. Finally, I asked if she really wanted to sew it after all or if I should sew it for her. I promised it wouldn't hurt my feelings if she wasn't interested in doing it herself. She confided, "Well, Mom, I love working with my hands, knitting and felting and doing art. But I don't like working on a machine." So there you have it! Sewing just isn't her thing, as least for now. One value I hold dear is to raise my children to be the people they were created to be. Not the person that I am nor the person I think they should be. Not according to my way or the way of others or the way society tells us we should go. But in accordance with his or her way, her natural bent. If having five children has taught me anything, it's that these children each come to us, not as blank slates, but as individuals with their own gifts, temperaments, strengths and weaknesses. I hope to do my best to help them become the people they were always meant to be. 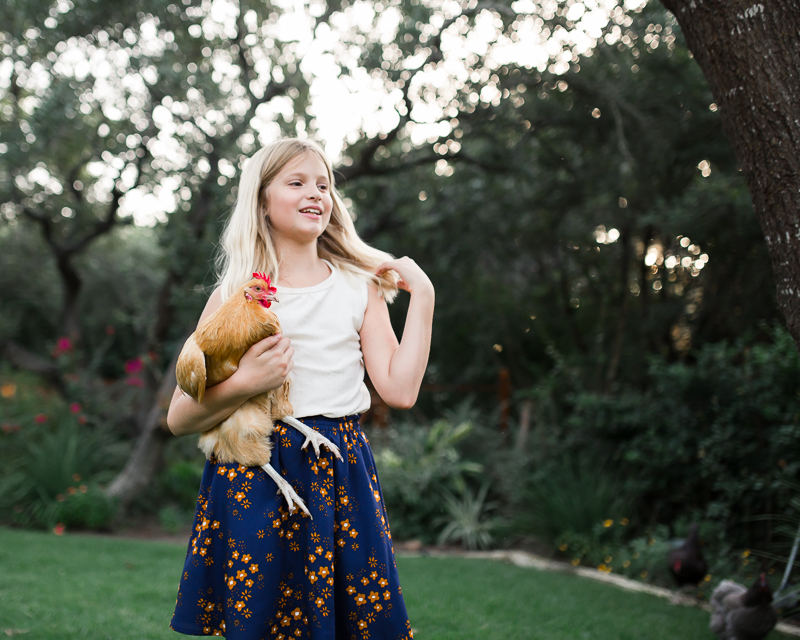 Indigo may not be into sewing, but she sure is into her chickens. 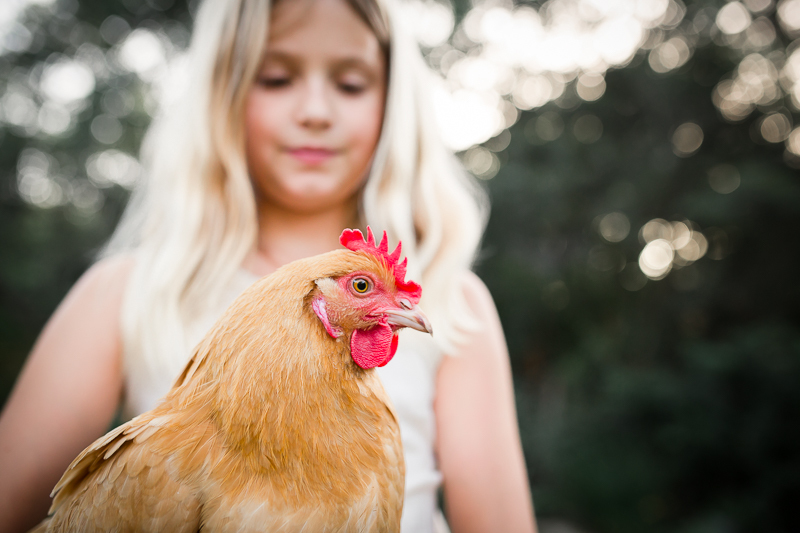 The first thing she does when she wakes up in the morning is to let them out of their coop. She gets their food and water before she even eats breakfast herself. 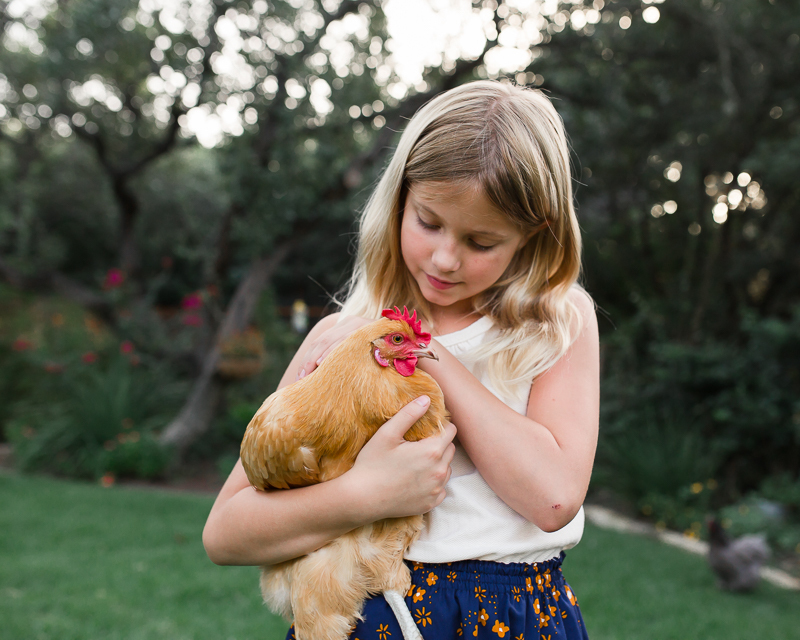 Her favorite chicken, Carrie, follows her everywhere she goes. 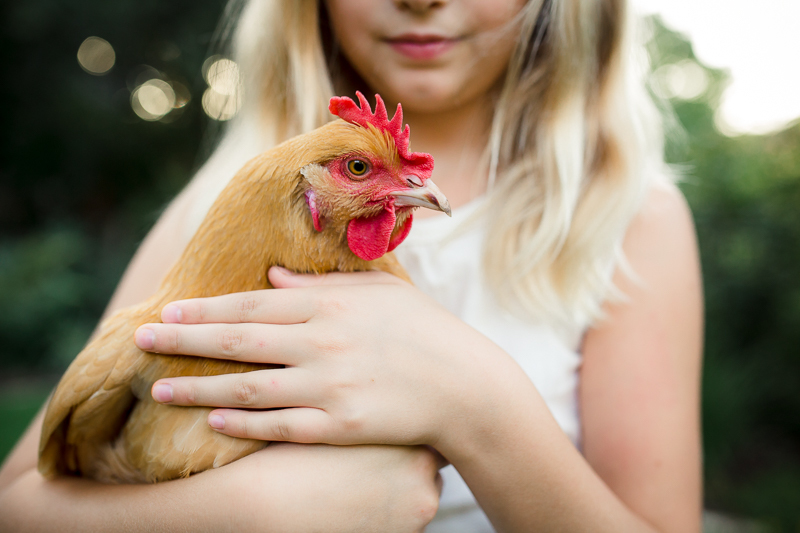 She never forgets to lock them in their coop at dusk. And if she sees that it's drizzling outside, she worries about them getting wet. She gathers them up and puts them into their coop. Even when I assure her that they will probably be just fine. 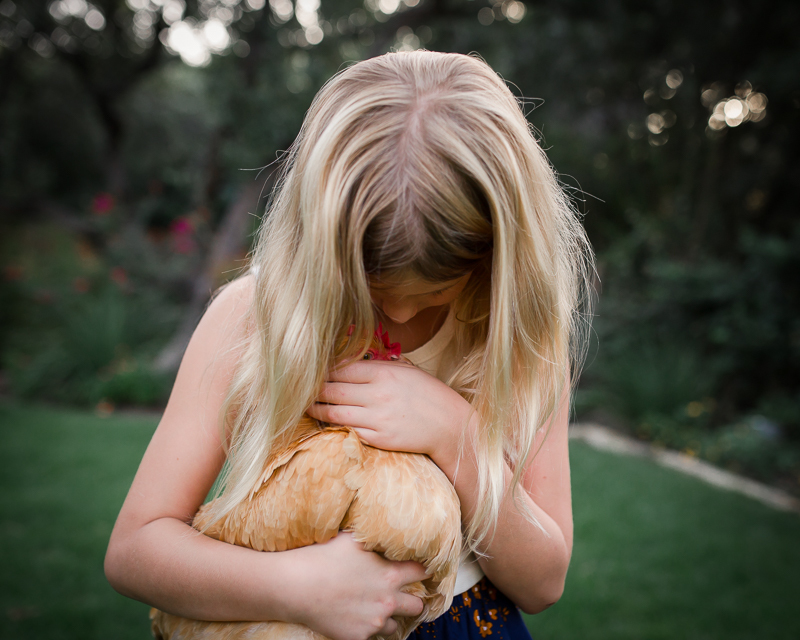 She's also crazy about her bantam silkies. This one is Joy. Doesn't she look like a Dr Seuss character? We love her. Indigo is an amazing, cheerful girl with an enormous heart and an immensely giving and nurturing spirit. 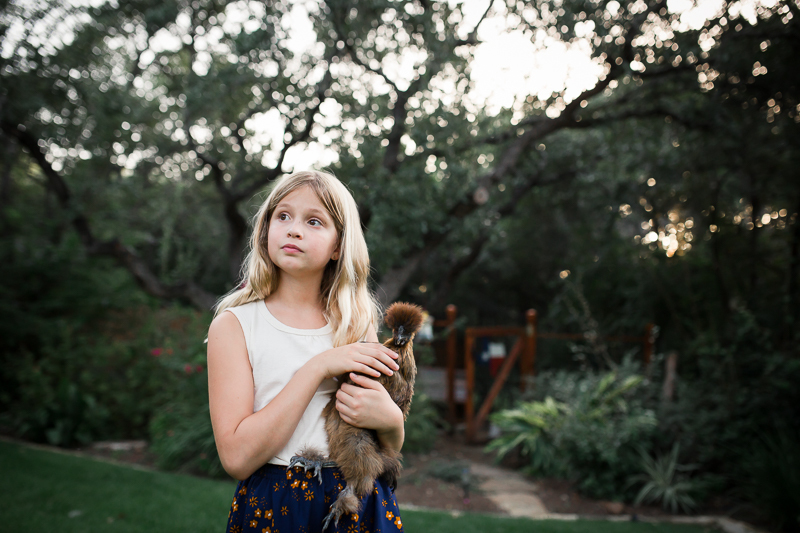 I am so grateful I get to be her mom. I love that thought... Raising them their way. So true! They're all so unique and need to be guided in the way that's right for them. 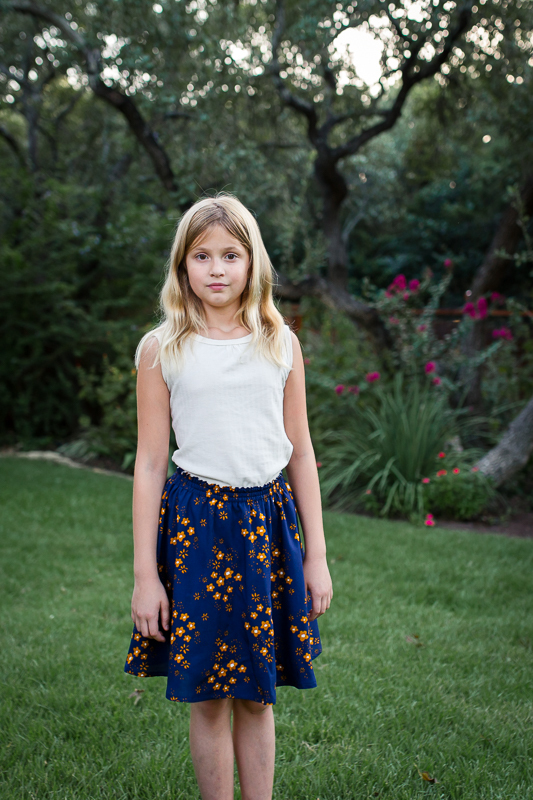 Lovely skirt and lovely girl! These are the best pictures and such a valuable life lesson. You are a wonderful mom!!! My teaching to Ansley hasn't been successful yet because I can't stand sewing on her machine and she doesn't want to use mine because hers is prettier. I do involve her in picking patterns and fabric and design elements and offer to let her sew straight lines on her garments occasionally. I love this. 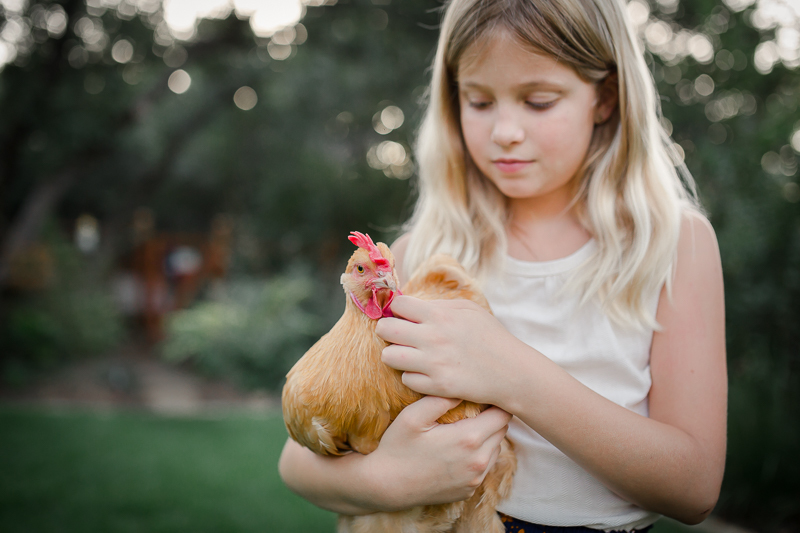 My newly 10-year-old daughter has been working hard to convince me that we should get chickens. 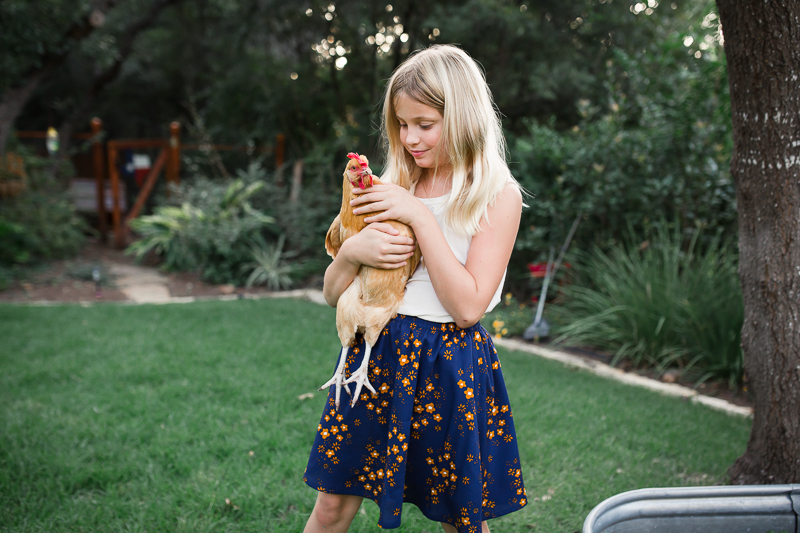 She's doing lots of research and has settled on Bantam Silkies as the best possible backyard chickens. 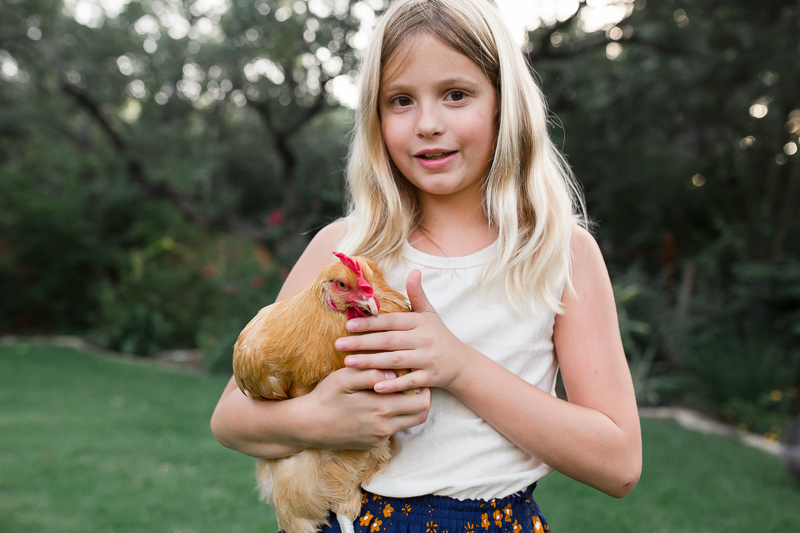 Love to hear that your daughter is getting so much out of having chickens. And there's tons of cool hand-sewing projects (not my favorite, but I love that it's hers). I love this approach to parenting and it's one I try to remember regularly because each of my kids has been so uniquely themselves since they were born. I love how she knows who she is. I am starting to see little snippets of this in my own girls these days, though they are a bit younger than Indigo. Her outfit is adorable and the photos, as always, lovely. I love this so much! Of course, it is easy to parent when our children are doing exactly what we want them to do and making us look good, but it's not always as easy when they go their own way. I know for me, Joe is a daily lesson in this - my child is his own self, and he does not exist to make me look good and brag to my friends! His successes, interests, difficulies, issues, are not actually a direct reflection of my mothering! I think in a way, having a special needs child teaches you this so thoroughly and so early, that you forget it's even a thing! Anyhoo, all that said, I know that learning to use a sewing machine is a very steep learning curve, and my own path to learning to sew had many starts and stops. She may change her mind one day! My mom finished all my projects when I was first learning, HA! This resonated with me sew much! My daughter is eight and has no...none...zero...nada interest in sewing on the machine but she loves other creative pursuits. Our children are a gift to us - and honouring that gift for who they are is our gift to them. Thank you for such a lovely post. Your skirt is adorable too! Lisa, I love what you wrote :: "Our children are a gift to us and honoring that gift for who they are is our gift to them." Beautiful and spot on! Thank you for sharing! Thank you for these beautiful words. My daugther is only 7 and a half months old but I can already see her little personnality and I cannot wait to discover who she came here to be. And Indigo. What a beautiful little lady she's becoming! She's such a sweet kid and I love the way you encourage her while letting her be true to who she is. You set a beautiful example for the rest of us. I love your honesty and hers!! Thank you for sharing your encouraging words! You are such a lovely mama! Rachel, I bet you are the best mom in the whole wide world. 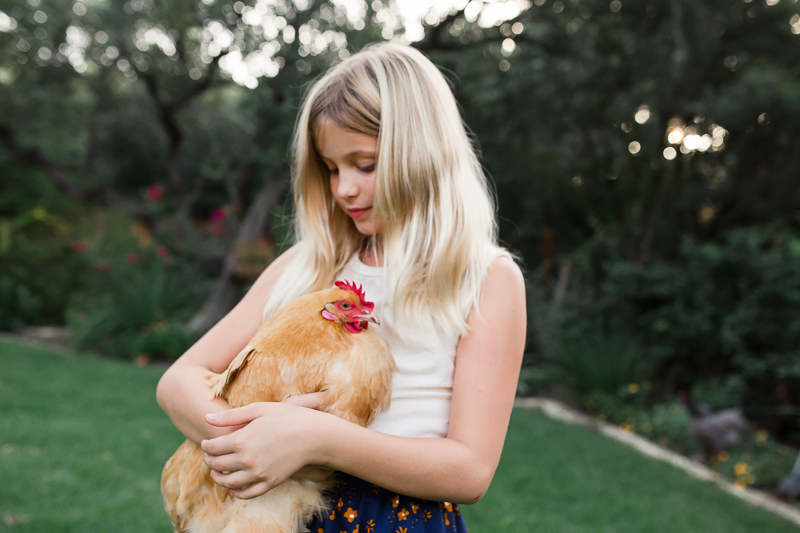 And those chickens, I adore them! 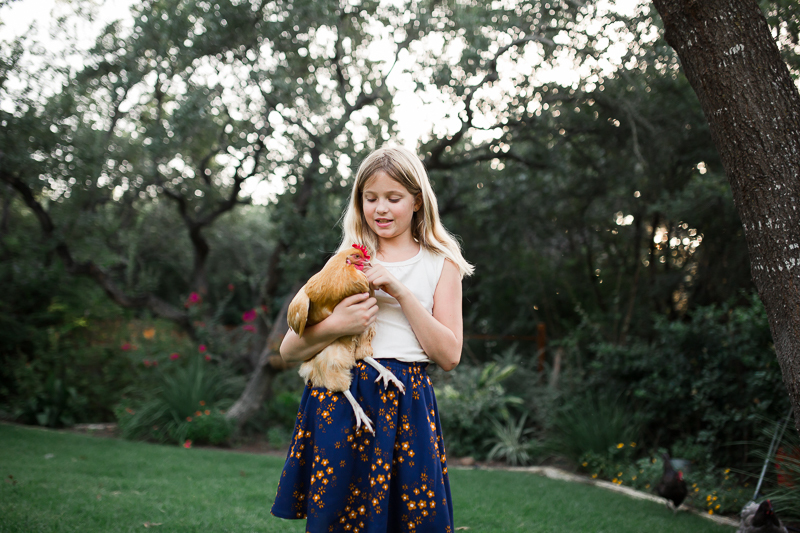 Or at least in the pretty pictures with your children (because, frankly, chickens freak me out :-))).